There’s nothing better than stumbling across a new candidate for your Inspirational Humans list. An artist, a film maker, an environmental activist; anyone that makes you visualize yourself fleeing your office, hands in the air and feet without shoes, blazing towards the nearest forest without care to return. As a member of the Society for Human Performance in Extreme Environments and winner of the Australian Geographic Society’s 2008 Spirit of Adventure Award, Carter sounds good from the onset. Further investigatory work (cough, creeping) on Google reveals images that support these accolades; barren adventures and enough hiking poles to sink a small ship prove Carter is about as courageous as they come. But if battling crocodile infested jungles in Papua New Guinea and trekking from the North Pole to Canada isn’t enough reason for you to love this guy, he’s got the creative gene too. 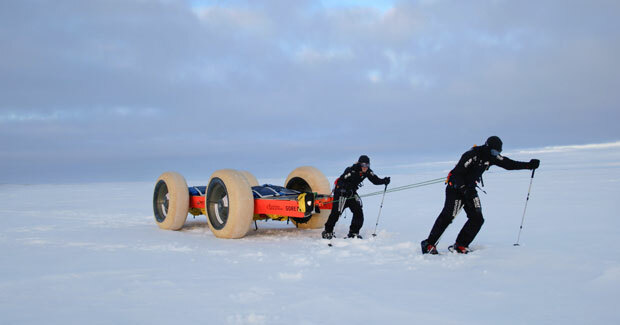 Clark, along with his expedition partner, Chris Bray, recently launched ‘The Crossing’, a feature documentary they filmed showcasing their relentless endeavour to conquer Victoria Island in the Arctic Circle. Their fearless determination involves homemade kayaks, thousands of kilometres of travel and tonne of passion and enthusiasm. Feeling inspired? Follow Clark on Twitter (@wheresclark) and get yourself along to a Clark Carter event stat.